And... for those few who still believe in the "Crypto Miracle," to overtake 2,000+ years of gold and silver as money, you have my sympathies. I am not going to get into any details, but just to say... don't count on High-Tech to solve our problems in the future. High-tech only creates more problems. So, if you believe high-tech is going to solve problems, then you don't understand the historical record on the "Collapse of Complex Societies." Regardless, I believe part of the reason the "once" precious metals bugs, have now become quite frustrated, is that they have been taken in by the Mainstream Financial Koolaide. And why shouldn't they? Stocks and real estate prices have been going up and up, until recently, for the past seven years while the metals peaked, declined, and have been virtually flat. Yes, it's frustrating to see the value of precious metals underperform the market while everything else seems to be heading toward the moon. But, that in itself should give anyone with a decent amount of intellectual know-how the ability to sniff out that... SOMETHING JUST AIN'T RIGHT. For some odd reason, all the negative aspects of the economy, the massive debt, derivatives, and leverage are all but forgotten when all we do is focus on the highly inflated stock, bond, and real estate asset values. Unfortunately, the inability to see how the debt, derivatives, and leverage have created the biggest Global Ponzi Scheme in history will create the largest financial collapse ever witnessed, causing most investors to go bankrupt. It's only a matter of time, and time is running out. So, when I write about gold and silver, I am not doing so because I want to see a 1,000+% gains in the metals (that wouldn't bother me either), but because there really isn't much else worth owning as "Liquid Investments" when the Phat Financial Lady finally sings. Thus, I don't focus on price targets or timelines, because that's a fool's game (one I was guilty of doing several years ago... no longer). Frustration occurs when something doesn't happen when or how we expect. Which means, it's best to focus on the critical information, make one's investment decisions, and let the system unfold in its due time. Because we focus on day-to-day news, we tend to overlook longer-term trends. While short-term information is important, it doesn't override longer-term fundamental trends. Well, yes... maybe in some cases, but if we take the collapse of the Ancient Roman as an example, it cannot be attributed to just the events that occurred over the last few years of the empire, but instead, the centuries it took for its Falling EROI - Energy Returned On Investment, to destroy it from within. Today, we are in the same predicament as the Ancient Roman Empire. However, the overwhelming majority of people don't see it because they are only focused on short-term results and information. Thus, to truly understand the future, we have to look back in the past. And, if we do this with gold and silver investment, we will see a very interesting trend. That turns out to be 520 million oz of gold and a nearly 2 billion oz of silver. Now, these figures only represent the physical bar and coin demand, including central bank net purchases. I did not include ETF's or similar products. First, there is no way of knowing if the gold or silver is over-subscribed in these precious metals ETF's or secondly, if all the metal that is listed, is contained in the vaults. So, the figures are likely much higher, especially for silver. 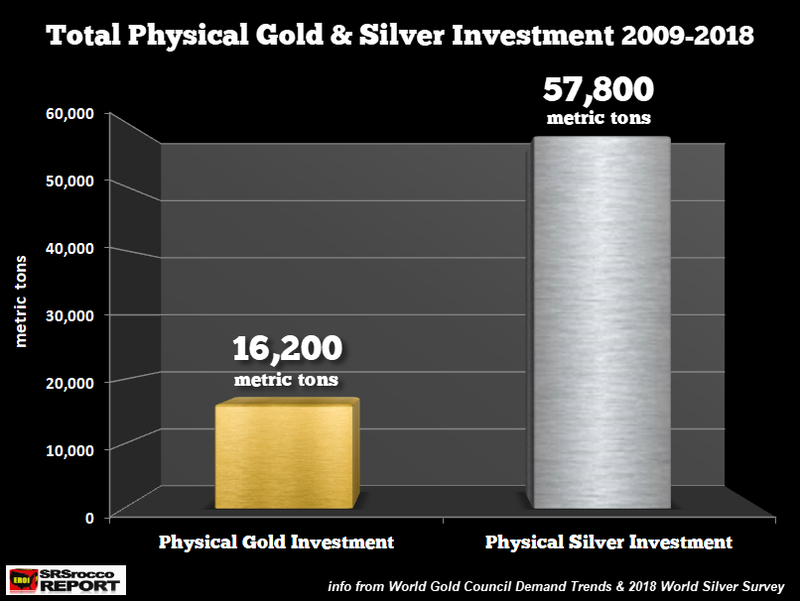 Last year, global physical gold investment was 1,090 mt versus 3,890 mt for silver. 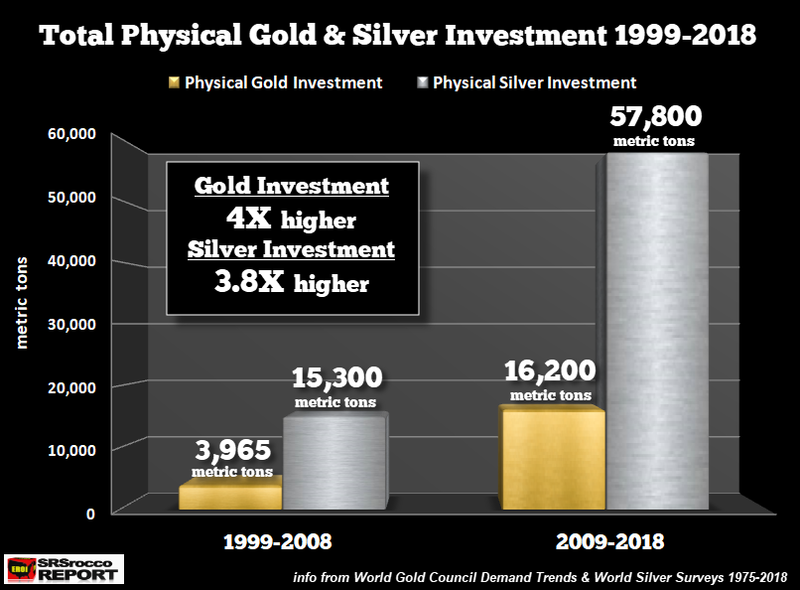 Yes, it's true that physical silver investment demand last year was much less than the 6,090 mt annual average (2009-2018), but silver's price and demand are much more volatile than gold. 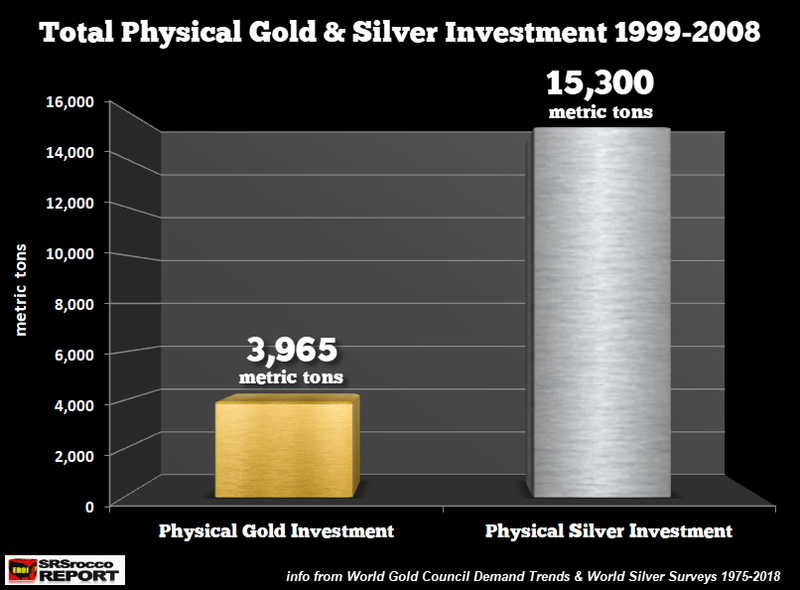 Physical gold demand is still quite strong and is nearly three times higher than before the 2008 financial crisis. Which means, savvy investors continue to acquire the yellow monetary metal, even though 99% of the world plays in the Grand Global Casino. That should say something about the strength of the precious physical metals demand with less than 1% of the market participating. What happens to gold and silver demand when the central banks are no longer able to prop up the financial and economic system. Please understand; it's not a matter of "IF," it's a matter of "WHEN." I believe it's the "WHEN" that is the concern of most precious metals investors. While it's impossible to give a date, logic suggests the timeline is speeding up. Lastly, I will be publishing several more articles on this subject matter and why gold and silver set themselves apart from the majority of assets. Thus, the future will come down to owning assets that "STORE ECONOMIC ENERGY" versus those that are "ENERGY IOU's."